Ken Uston, as well as Arnold Snyder and Edward Thorp, has left a huge heritage for blackjack players in his blackjack books where he described his big experience at this game, shared interesting blackjack stories which happened to him, described his blackjack techniques and the concept of team play at blackjack. Being a great mathematician, Uston wrote not only books but also computer and video games: he was the author of numerous computer guides and strategies how to beat different video games. Anyway, the world of blackjack knows Ken Uston as the author of 4 bestseller books on the topic of blackjack; they were written in the end of 1970s - the beginning of 1980s and made Uston to be a significant figure of blackjack whose influence helped this game to develop. What blackjack books of Ken Uston do we know? This is the first book of Ken Uston which made him to become known and popular blackjack player and put a full-stop to his relations with Al Francesco. Here you will not find any card counting systems, techniques etc. : The Big Player tells readers about Ken Uston’s adventures being a part of Al Francesco’s blackjack team and winning great sums of money at different casinos. Uston opens all the secrets of blackjack team play: how the team’s members played in order to beat money out of casinos, what schemes they used and so on. The Big Player is more like a fiction – an interesting content to read. This book is also known as a part of Two Books on Blackjack: the second one is How You Can Win at Blackjack in Atlantic City and Nevada. It tells about the methods each player can use for increasing his chances to win at blackjack: schemes, tips, techniques; and certainly, the interesting stories from the author’s life: it is impossible to imagine any Ken Uston’s book without his enjoyable style of writing. The book is your great helper if you want to improve your blackjack skills and become a great card counter: it tells about different card counting systems which can help you to win big money at blackjack: for example, there you can find the description of The Uston Advanced Plus/Minus count. 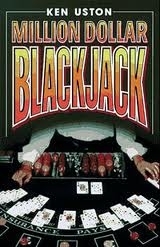 Million Dollar Blackjack is easy and understandable to read: all card methods described there are easy to learn. This book is described as the real Bible of blackjack as it has everything that is needed to know about card counting at blackjack. This book can be described as a diary of Ken Uston: he did not write much about schemes and techniques of blackjack for improving your skills as a player; Uston described his personal and his blackjack team’s adventures in different casinos of Las Vegas and Nevada, told about court processes where he tried to prove the right of players for using card counting at casinos. The book opens its readers the sense of Ken Uston’s life during the period of his blackjack career: both victories and fails, positive and negative sides.